Skip Intro, Jump Straight to Silver Eagle Buying Guidelines. American Silver Eagle bullion coins are produced by the United States Mint. Every coin is guaranteed to contain one troy ounce of 99.9% pure silver and has a face value of one dollar, far below the worth of its intrinsic silver content. Obviously, no one is going to walk into a convenience store and pluck down a Silver American Eagle bullion coin to purchase, say, a candy bar, but theoretically, someone could, since it is legal tender. What's more, the clerk probably wouldn't know what to do if handed a Silver Eagle, amplifying the absurdity of the scenario. Because American silver eagle bullion coins ARE indeed real silver dollars, they DO enjoy a collectible value above and beyond their precious metal content. Much of the collectible component in an individual coin can be driven by quality (i.e. state of preservation), also called grade or condition, as manifested by a numerical score assigned by a third party grading service. Example scores are MS-69 or MS-70 (see our Grading section to learn more about this terminology). Therein lays a potential pitfall for collectors: How much extra (above its intrinsic bullion value) should one pay to acquire a graded (or ungraded, for that matter) one ounce Silver Eagle? Over the years, US Coin Values Advisor has received numerous requests for retail value trend data on silver and gold bullion coins issued by the United States Mint. Although the primary mission of this site is to track long term selling prices of collectible United States coins and make buying recommendations, it is hard to ignore the activity in the bullion coin market. A total of 47 million $1 American Silver Eagles were sold by the Mint in 2015, the highest annual total ever since the Silver Eagle program began in 1986. In 2016, almost 38 million Silver Eagles were sold. Some of the $1 Silver Eagles are being graded and encapsulated by the leading grading services today, PCGS and NGC. On any given day, you can find dozens (if not more) of them being sold on eBay, yet the number of raw, ungraded Silver Eagles being also being sold on eBay dwarf those handled by the grading services. The variance in selling price for the exact same product is astounding. All too often, many buyers end up paying a lot more than what they should have. Perhaps had buyers who paid too much had a better idea of what the "going rate" was for an American Silver Eagle, graded or ungraded, they would have saved a few bucks. In order to assist Silver Eagle buyers to spend their money wisely, we toiled nine months in 2015 compiling weekly selling data from eBay for MS-69 coins graded by PCGS and NGC, as well as ungraded examples. In the universe of graded Silver Eagles, the big majority of activity is occurring at the MS-69 level, so that would be a useful area of study, we reasoned. The goal of the study was to establish statistically meaningful guidelines for Silver Eagle buyers to avoid spending more than they should (an occurrence far too common in our observations). 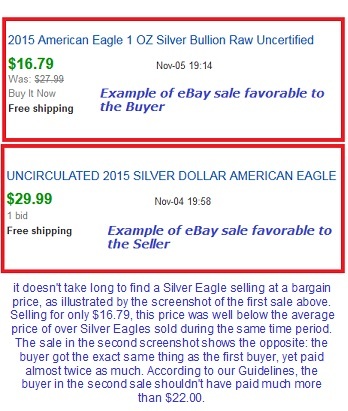 With so many Silver Eagles for sale at any given time, if bidding has moved higher than it should, why keep bidding? Go on to the next sale, fer cryin' out loud! But where is the bidding cut off point? Think of it like this: would you pay $3.50 for a gallon of gasoline when another station across the street is selling the exact same gallon of gas for $3.00? No one would do anything like that when its time to fill the gas tank, but in the world of buying Silver Eagles, this common sense precept often does not hold. Unfortunately, our attempt to develop buying guidelines for MS-69 coins graded by PCGS and NGC failed. The data just didn't lend itself to developing a reliable mathematical model for estimating bidding maximums for buyers. The numbers were all over the place with few established patterns. Compounding the difficulty was all the gimmicky labels attached to some graded coins. Example labels were “First Strike”, “Blue Label”, “W mint mark”, "Rainbow", "Wyatt Earp", etc. It seemed like every week, some new marketing angle was being deployed. How much did these influence buyers to overpay? Probably too much to make valid conclusions, so sorry, we have no buying guidelines for graded/certified Silver Eagles. Silver Price: The silver price for a given week was calculated as the average of the five daily closing silver prices that week. Speaking in the vernacular of a mathematician, these were the "known x's" during the computation phase of the study. Samples Gathered: On average, well over 100 samples from successful eBay sales were gathered weekly. Average and median sale prices were determined for the week, as well as the selling range. Ridiculous outliers (there were not too many, thankfully) were tossed from the data set. The weekly selling data were used to generate the "known y's". Excluded from Study: Only Silver Eagles being sold without some type of enticement (e.g. birthday box, sports team logo) were used in the study. Much like any commodity, one Silver Eagle is just like any other. Shipping Cost Consideration: The shipping cost, if any, was included in all the data gathered for the computations. Silver Bullion Price Movement: The lowest weekly silver bullion price during this study was $14.53/oz. The highest was $17.21/oz. Not a tremendous amount of silver movement over the nine month study. Wide Range between Lowest and Highest Prices Paid: Each week, a selling range was calculated, using the Highest Selling Price minus the Lowest Selling Price. The average weekly range was $9.29, with a standard deviation of $2.59. This illustrates eBay customers were paying a wide difference in prices for the exact same thing. Some buyers got real good deals. Others folks made some sellers very happy. Estimated Premium for Silver Eagles above Bullion Price: Though not a hard and fast rule due to the volatility of the data, a reasonable benchmark is to use $5.60 as a premioum above the silver price to estimate an approximate ceiling for what a buyer should pay for a Silver Eagle. Example: If the silver price is $15.00/oz, a buyer should think twice about paying much more that $20.60 for an ordinary, ungraded Silver Eagle. Applicable Guidelines: The Silver Eagle Buying Guidelines below are applicable for bullion prices at $12.50/oz and goes up to $20.00/oz. Should silver move below or above the silver prices listed, more sales data will be collected and analyzed in order to extend the guidelines. We've been keeping watch on the silver price for years now. See table below. If you were sitting on top of a pile of silver in mid-2011, waiting for prices to go higher, you missed the boat. Just as surely as the sun will rise tomorrow morning, bullion prices will spike dramatically again, though you might have to wait another decade or two. We encourage silver bullion coin buyers to regard themselves foremost as Silver American Eagle Dollar collectors. In other words, approach the subject as a hobbyist might. For instance, get acquainted with the history of the Silver Eagle program and learn about coin collecting terms such as Proof and Uncirculated mintage. Do this, and you’ll become a more adept buyer, positioning yourself for greater rewards. What’s more, you may discover the joy (and potential profitability) of traditional US numismatics along the way. We have a section toward the bottom of this page that provides a more in depth view of the American Silver Eagle bullion dollar. Here are the quick links to various chapters. Professional Coin Grading Service (PCGS) started their operation in February 1986 as a pioneer in the coin grading business. Since then, they’ve graded tens of millions of coins. PCGS is universally regarded as one of the leaders in providing reputable third party grading services. Numismatic Guaranty Corporation (NGC) was founded in 1987. More than 20 million coins have been graded by NGC. Among the numismatic class, NGC has a trusted, stellar reputation. There are several other smaller coin grading services around, most of which raise concern because of their lax grading standards. Unfortunately, less experienced buyers frequently pay way too much for Silver Eagles slabbed by the second tier grading services. In our opinion, you should pay no more for these particular Silver Eagles than you would for ungraded, standard bullion issues (see section below), because if someday you choose to sell, no informed buyer will offer you much more than the silver content value. Based on the fact that the average sale price is above that of the standard bullion issue, many buyers are not heeding this advice. Here is another point to ponder. Virtually every Silver Eagle slabbed by these outfits are "Perfect" MS-70's. They very rarely list MS-69 or below coins. That right there should tell you something about their operation. Note: The value trends and commentary in this section DO NOT include coins graded by ICG or ANACS. Both these services have fine reputations, but there were not enough American Silver Eagle bullion coins sold on eBay with their labels to constitute a sufficient sample size. 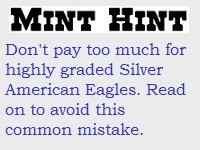 The vast majority of Silver American Eagle bullion coins sold are not labeled with a grade. Most likely, an individual coin gets to the end buyer from the Mint through middlemen dealers without being labeled and does so because it (1) was looked at by a dealer but deemed not worthy of the grading process, or (2) never was evaluated by a dealer for grade potential to begin with. The Silver Eagle sales recorded in our data collection process DID NOT include coins packaged in special gift boxes or any type of display cases, nor colorized coins. Some buyers will pay more to acquire a standard Silver Eagle with above average presentation qualities. That's fine, but no one making such a purchase should expect to recover their extra cost if they in turn decide to sell. Beginning in the 1970’s, momentum started to build for the federal government to sell off surplus silver from the Defense National Stockpile Center (DNSC). Some legislators viewed the sale of the unneeded silver as a good way to bring in revenue. While this may have seemed like a wise course of action, the mere mention of a government sale caused the silver market to plummet, as traders dumped their futures contracts in anticipation of falling prices. 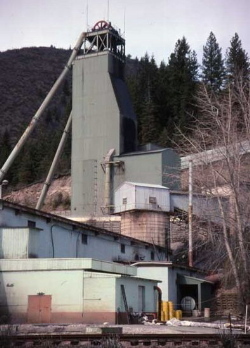 The Lucky Friday Mine of the Coeur d’Alene district in Idaho has long been one of the top silver mines in the world. In 2009, it produced 3.5 million ounces. Image courtesy of Wikipedia (Plazak). In July 1981, Congress agreed to sell 105.1 million troy ounces of the stockpiled silver over the next three years, leaving only 25% of the original total. The first auction occurred in October 1981, but further sales were blocked due to skilled maneuvering by congressional members of silver producing states. As further attempts to resume sales were stymied, the silver spot price rose in response to the gridlock, plus increased worldwide demand for the metal. Still concerned about the possibility of releasing silver from the DNSC and resultant price plunges, Senator James McClure of Idaho – a major silver mining state – proposed legislation several times throughout the early 1980’s to provide for the disposal of silver from government storage through the issuance of silver coins. “...if we are forced to accept a sale, why use the method guaranteed to depress the price and dispose of the silver with the lowest possible return to the taxpayers? Why not instead, if we must sell, at least get as much for it as we can? Therefore, today, I am introducing legislation which provides that in the event the President proposes and Congress authorizes the sale of silver from the strategic stockpile, this silver would be sold through the minting and distribution of a silver-bearing coin”. -- Authorizes the Secretary of the Treasury to mint and issue silver bullion coins. -- Defines coin specifications: diameter, weight, fineness, general design, inscriptions, and edge finish. Regulation of coin sales. -- Establishes numismatic (i.e. Proof) and legal tender statuses. -- Silver is to come from the Defense National Stockpile Center. -- Stipulation that no coins may be issued or sold before September 1, 1986. The first American Silver Eagle bullion coin was struck at the San Francisco Assay Office on October 29, 1986. [This was the third SF Mint building, opened in 1937. In 1962, it was demoted to an assay office, but was restored to mint status in 1988]. Treasury Secretary James A. Baker III was on hand for the striking ceremony. As Baker activated the coining press with the push of a button, he remarked “I don't need a pick and shovel to start the San Francisco Silver Rush of 1986”. Silver Eagle bullion coins were released by the United States Mint to the eager public on November 24, 1986. The image on the front side of the American Silver Eagle bullion coin did not originate specifically for this issue. It was first used on the Walking Liberty Half Dollar of 1916 to 1947. The “Walker” design of Adoph A. Weinman was well liked by the public during its heyday, so when the new United States silver bullion coin was authorized, the decision was made to re-introduce Weinman’s concept to a new generation of Americans, in anticipation that it would increase the popularity of the Silver Eagle. The reverse, on the other hand, was designed especially for the Silver Eagle. John Mercanti, a sculptor/engraver who joined the US Mint in 1974 and went on to produce more coin and medal designs than any employee in Mint history, created the reverse image. The central element of Mercanti’s design is a heraldic eagle with shield above breast grasping an olive branch (peace) in its right talon and arrows (strength) in the left, reminiscent of the Great Seal of the United States. The Great Seal first appeared on US coinage in the 1790’s and very early 1800’s. There are 13 stars above the eagle representing the 13 American colonies. Reverse inscriptions include UNITED STATES OF AMERICA, 1 OZ. FINE SILVER-ONE DOLLAR, and E. PLURIBUS UNUM (Latin for “Out of Many, One”). The Walking Liberty Half Dollar of 1916-47 was the model for the obverse of the American Silver Eagle bullion coin. Designed by Adolf A. Weinman, the "Walker" was widely acclaimed as one of the most beautiful coins in United States history. Coin Photos courtesy of Heritage Auction Galleries. The legislation passed in 1985 required that the silver used in the bullion coins be acquired from the DNSC. As the stockpile dwindled over the years, it became obvious that if the American Silver Eagle program was to continue, new legislation would eventually have to be enacted to permit a new source of silver. In June 2002, Senator Harry Reid of Nevada introduced a bill called the “Support of American Eagle Silver Bullion Program Act”. The bill was passed by both houses of Congress and signed into law by President George W. Bush on July 23, 2002. The new law ensured the extension of the Silver Eagle coin by authorizing the Secretary of the Treasury to purchase silver on the open market when the DNSC silver stash was depleted. Public Law 107-201 authorized the acquisition of silver from sources other than the Defense National Stockpile Center, as required in the 1985 law that established the American Silver Eagle program. This was necessary if the Silver Eagle was to continue, since by 2002 it was clear the stockpile would soon be depleted. Image Courtesy of United States government. From the inception of the Silver American Eagle program in 1986 until 1992, Proofs were minted at San Francisco and carry the “S” mintmark. 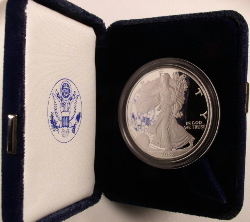 From 1993 to 2000, Proof Silver Eagles were produced at the Philadelphia Mint and accordingly bear the “P” mintmark. In 2001, the proof operation was transferred to the West Point Mint, where it remained until production ceased in 2008. Naturally, West Point Silver Eagle Proofs display the “W” mintmark. Proof Silver Eagles were ordered directly from the Mint, delivered in upscale packaging. Image courtesy of Coin Page. All throughout this time, individuals could order Proof specimens for the current year directly from the Mint, packaged in a plastic capsule shield, displayed in an upscale presentation case, along with a certificate of authenticity. Proof production was halted in June 2008 when the Mint announced all Silver Eagle planchets were going toward the making of the bullion version of the coin, due to very heavy demand from precious metals buyers seeking a hedge against inflation in the face of a global economic downturn. No Proofs were issued in 2009. Proofs were not issued in 2010 through October. However, on Nov 23, 2010, the Mint began offering American Eagle Proof coins for sale. In 2016, Proof coins continue to be offered by the Mint, and carry the "W" mint mark. It is easy to distinguish a "W" Silver Eagle Uncirculated (top photo) from the "W" Proof version (bottom). The Proof has mirrorlike reflective fields. Images courtesy of United States Mint. The term “Uncirculated” is a bit tricky when discussing Silver American Eagles. From 1986 through 2005, “Uncirculated” really meant any Silver Eagle that was not a Proof, and were struck by the millions and marketed simply as silver bullion coins. These bullion coins, or if you will, “Uncirculated”, were distributed to retail buyers through a network of authorized purchaser wholesalers (see section below to learn how this network functions). A small percentage of the bullion coin population that by luck escaped the rigors of mass production (i.e. suffered very minimal scratches, abrasions, or other imperfections), were pulled aside, graded, and encapsulated (aka “slabbed”) in private enterprise holders (e.g. PCGS). These high grade Uncirculated Silver Eagles were sold to collectors at a premium above (sometimes too far above) their bullion coin value. None of the Uncirculated Silver Eagles dated 2005 and earlier have a mintmark. Things changed in 2006. In celebration of the 20th anniversary of the Silver Eagle program, the Mint began offering directly to the public a collectible Uncirculated version of the coin. These special Uncirculated Silver Eagles are produced by individually hand loading a specially burnished (i.e. polished) blank in the coining press and striking. The finished product is housed in glitzy packaging, similar to Proofs. Burnished Uncirculated Silver Eagles were coined at West Point from 2006-08 and bear the “W” mintmark. None were produced in 2009 or 2010. Of course, during the years of the Burnished Uncirculated product, standard bullion coins worthy of the grading process, but having no mintmark, continued to be slabbed by grading services and marketed as Uncirculated Silver Eagles. Thus, collectors had two types of Uncirculated Silver Eagles to consider: one specifically manufactured, packaged, and marketed directly by the Mint with a “W” mintmark and dated 2006, 2007, or 2008, and the other arising from the ranks of the standard bullion population with no mintmark, distributed by a network of authorized wholesalers. Burnished Uncirculated were issued again by the US Mint, starting in 2011 and continued through 2014 and, as before, bore the "W" mintmark. The 2015-W Uncirculated Silver Eagle will go on sale from the Mint on March 26, 2015. Just as with the gold and platinum line of bullion coins, the Mint does not sell American Silver Eagle bullion coins directly to the public. Their distribution method employs a network of “authorized purchasers”, consisting of banks, brokerage companies, coin dealers, and precious metals firms. To become an authorized purchaser, a company must meet numerous stringent requirements. The Mint distributes Silver American Eagle bullion coins to authorized purchasers through shipments of green "Monster Boxes" Each box containes 500 coins. Image courtesy of Wikipedia (Diiscool). 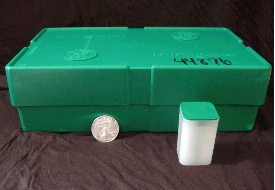 Bullion coins are shipped in green "monster boxes." The boxes are made of plastic and each box holds 500 coins. The 500 coins are packaged in 25 tubes with a capacity of 20 coins per tube. The wording “United States Mint” is written a couple of times in elevated lettering across the lid of the Monster box, complemented by two Treasury Department seals. Every box is specially strap sealed and assigned a serial number before shipping to an authorized purchaser. The Silver Eagles are sold to authorized purchasers in quantities of at least 25,000 coins per order. The authorized purchasers pay $2.00 per coin above the silver spot price. Once in the hands of an authorized purchaser, Silver Eagles are retailed to the general public. After a brief step back in March, the Rare Coin Values Index (aka the Index or RCVI) resumed its winning ways in April, rising 2.23 points, once again landing in record territory. For only the third time in the last 12 months, the Rare Coin Values Index posted a loss, dipping a mere 0.55 points. This follows on the heels of the best month in three years in February. We've been publishing this report for 10 years now. The 2019 edition is now available. Copyright © 2003-2019 US Coins Values Advisor. All rights reserved.